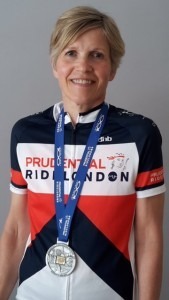 Our Director of Business Strategy Helen Brett and her husband Steve cycled in the Prudential RideLondon 100 last week. Here she talks about her experience, and why it’s so rewarding. If you feel inspired to cycle for YMCA St Paul’s Group next year and fund raise for us, do get in touch as we have spaces for the Prudential 46 and the 100 mile rides. Send us an email to enquiries@ymcalsw.org. Q: Was this the first time you’ve cycled in a ride like this? A: No, I have done a few long rides including the Ride London last year, although this event is the longest. I am a keen cyclist and a member of The Stragglists, the cycling section of my running club, The Stragglers which is based at YMCA Hawker. Q: Can you describe the atmosphere and camaraderie on the day? A: It’s a brilliant day! Nerve racking at the beginning as you line up with hundreds of others ready for the start, but everyone is so friendly, you can chat while you wait for the off. Throughout the ride, you see all sorts of cyclists, from the speedy MAMILs (Middle aged men in Lycra!!) to the slower, less experienced and those on tandems and other specialist bikes. Q: What was the worst part of the ride? And the best? A: The worst was the long delay at Pyrford due to a competitor accident; we weren’t worried about the wait, just concerned for the cyclist who was affected. The best part was cycling back into London and along the Mall having completed the ride safely, and of course my lovely, beautifully designed, large and heavy medal! Q: What kind of training did you need to do to prepare for a ride like this? A: I’m a regular cyclist, so I was already cycle fit, but I still did quite a lot of training, including a number of rides following the actual route from Hampton Court out to the Surrey Hills and back to Kingston. 100 miles is a long way to cycle, and is more enjoyable if you’re prepared. Q: How long did it take you to complete the ride? A: The actual cycling time was 6:18, but the total time 8:18. The difference is mainly due to the delay at Pyrford which was approximately 1½ hours. Q: Did you have supporters along the route, where were they? A: Yes, friends from the running club and park run were at Hampton Court on the way out and in Kingston on the way back, which was lovely. Q: How did you get your place? A: It can be very difficult to get a place in the ballot, but I was successful. My husband has applied four times (since it first started) and still hasn’t been lucky enough to get a place. So he has now ridden it twice for charity. Last year for MIND and this year for Parkinson’s, helping to make a difference to causes that are close to us. Q: Would you do the ride again? A: Never say never, but having done it last year and this year, I don’t anticipate doing the 100 again any time soon! However, I am hoping to enter the Ride 46 next year, supporting YMCA St Paul’s Group.